The Sagittarius Dwarf Elliptical Galaxy (SagDEG, Sag dSph) is a satellite galaxy of the Milky Way and the second closest external galaxy after the Canis Major Dwarf. It is populated, as is usual for a dwarf elliptical galaxy, by old yellowish stars. Obscured by large amounts of dust in the galactic plane, SagDEG was discovered as recently as 1994. It has four known globular clusters – M54, Arp 2, Terzan 7, and Terzan 8 – of which M54 is easily the brightest and was the first extragalactic globular cluster ever found, by Charles Messier in 1778. 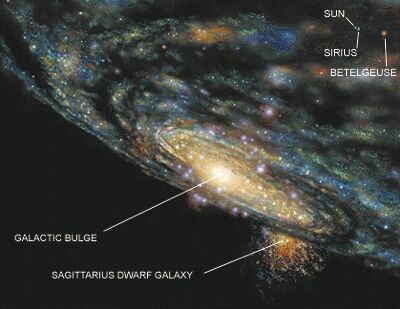 SagDEG orbits our galaxy in less than one billion years and must therefore have passed through the dense central region of the Milky Way at least 10 times during our galaxy's lifetime. The fact that it has remained intact suggests that SagDEG may contain a significant amount of dark matter that helps to bind it together. It is, however, apparently now in the process of being disrupted by tidal forces of its massive neighbor. This may lead to its globular clusters and many of its other stars finding a new home in the Milky Way's halo, while its remaining stars escape to become solitary intergalactic travelers. SagDEG should not be confused with another member of the Local Group, also in the constellation Sagittarius – the Sagittarius Dwarf Irregular Galaxy (SagDIG).